If some of the previous plays in the set – The Basement especially – were designed specifically for television (utilising numerous scene changes in a way which would have been impossible to achieve on stage) then Old Times turns out to be a very different beast. The staging is very theatrical with no concessions made to the television format. At the time (and indeed well into the eighties) this style of production was very common, but eventually it fell out of favour. The quest for realism demanded that drama be shot on single-camera film, with the result that multi-camera videotaped recordings of this type began to look hopelessly old-fashioned to certain people. Personally, I love the clarity of this type of production as it really does stand or fall on the quality of the writing and the performances. There’s no place to hide …. The stagey nature of the piece is evident right from the opening titles. Deeley (Barry Foster) and Kate (Anna Cropper) are seated in separate chairs. The room is dark and they are immobile (whilst the fact that both are spotlighted helps to suggest their emotional distance from each other). Meanwhile, Anna (Mary Miller) stands in darkness at the back of the room. Deeley and Kate are a married couple, awaiting the arrival of Kate’s old friend, Anna. That the play begins with Deeley and Kate discussing Anna (who is present but ignored by them) gives the piece a strange, disconnected air. This odd feeling continues when Anna suddenly steps into the light and begins interacting with the other two. Several theories have been propounded to explain the meaning of the play. Possibly the whole drama is being played out in Deeley’s subconscious (and furthermore Kate and Anna are aspects of the same person). When Anthony Hopkins tackled the role of Deeley in 1984 he asked Pinter for some pointers. The playwright’s advice? “I don’t know, just do it”. Old Times finds us in familiar Pinter territory. A previously tranquil household is transformed into a battleground for supremacy as Deeley and Anna both stake their claim on Kate. As the play unfolds, every statement has to be parsed for meaning as the three interlock. Deeley begins the play in a dominant position, quickly joining forces with Anna to reminisce about times past via a medley of their favourite songs. Kate at this point seems to be somewhat passive and colourless compared to Anna. Deeley is keen to claim ownership of his wife (remembering how they bonded over the same film – Odd Man Out) but his own memories of Anna and the revelation of her previous closeness with Kate both serve to somewhat destabilise him. (a lengthy discussion between Deeley and Anna about the best way to dry a freshly bathed Kate crackles with intensity). As ever, if you want closure and neatness then you’ve come to the wrong playwright. Old Times is an emotionally distanced experience which isn’t afraid to leave questions unanswered. The fallibility of memory, a familiar Pinter device, is key here. And if there’s some doubt about the reality of the present-day setting, how many of these past reminisces can we actually rely upon? Clocking in at just twenty minutes, Monologue is the shortest main feature on the Pinter at the BBC set, but even with this brief running time it’s still unmistakably Pinter. The staging is simple – a single room with one occupant. The unnamed man (Henry Woolf) addresses an absent friend represented by an empty chair. As the monologue progresses, several questions begin to form. Is his friend dead? Or did he ever exist? And what about the black girl, who drove a wedge between their friendship? Watching the plays on the set in transmission order, the parallels between this and The Basement helps to highlight the way that Pinter always returned to certain themes (for example, how male friendship can be disrupted by the arrival of a female. Christopher Morahan, who had directed two of Pinter’s Theatre 625 plays a few years earlier, treats the empty chair as a character in its own right. Therefore just as the camera occasionally zooms into Woolf, it also does the same with the chair. A simple camera operation, but it’s still very effective. With Woolf addressing the empty chair rather than the camera, the viewer is therefore placed in the position of an outsider, taking a voyeuristic interest in the unfolding drama. This is reinforced by the way that the camera begins proceedings outside the door before entering the room (and then at the conclusion of the talk discreetly exits). Henry Woolf’s friendship with Harold Pinter dated back to the 1940’s (as detailed in this Guardian article). His relationship with this piece would also be lengthy (he performed it again at the National Theatre in 2002). A fairly neglected piece, Monologue doesn’t offer any startling revelations, but it remains a memorable Pinter miniature. 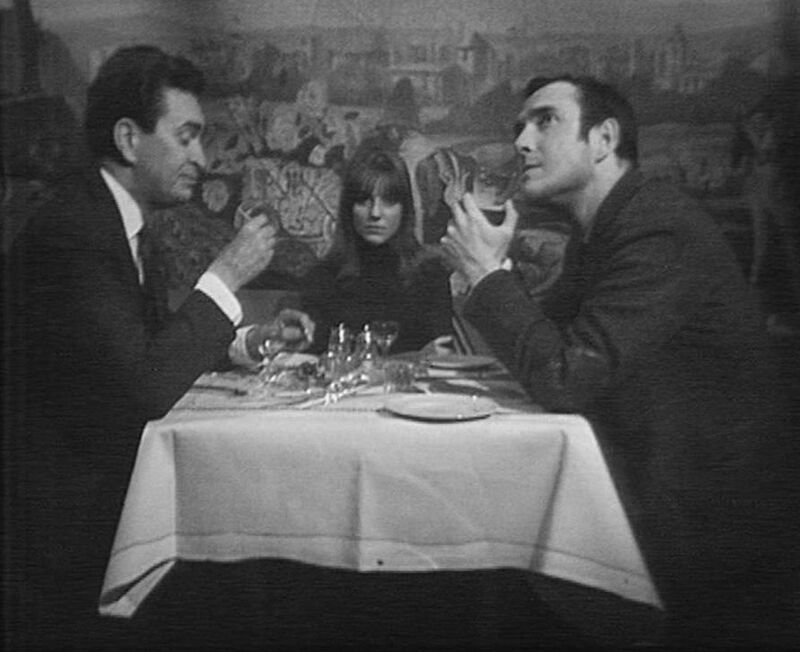 Law (Derek Godfrey) finds his cosy basement flat invaded by an old friend, Stott (Pinter) and Stott’s young and mainly silent girlfriend Jane (Kika Markham). 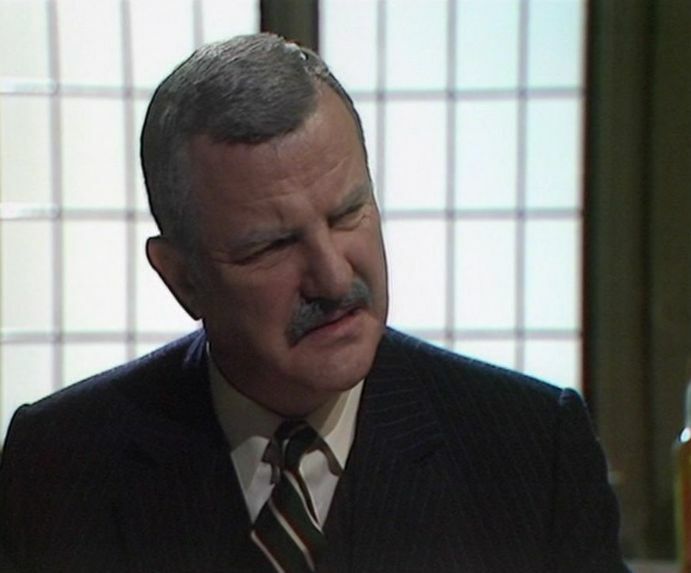 Whilst initially pleased to see Stott, Law is less enthused when the pair begin to take ruthless charge of his surroundings …. Although the third and final Pinter play from his Theatre 625 trilogy may initially seems to be on familiar ground (a mysterious individual indulging in oblique power games) The Basement quickly evolves into something much more interesting than might have been expected from the opening ten minutes. Based on the first few scenes, the television viewer of 1967 would no doubt have expected a linear development of the opening theme. We have three central protagonists – the ebullient Law, the monosyllabic and slightly threatening Stott and the unfathomable Jane – and a well designed basement flat for them to co-exist in. With a running time of just under an hour, there seems ample scope for the three of them to clash. And so they do, just not in the way that was probably expected. Whilst Tea Party featured some jarring cuts and fantasy sequences, these are much more pronounced in The Basement. Indeed, it’s possible to have some debate as to where reality ends and fantasy takes over (the final scene – delightfully circular in nature – floats the possibility that everything we’ve witnessed has been untrue). The first jarring reality shift comes ten minutes in, as the action abruptly switches to a beach. Whilst Jane makes an elaborate sandcastle, the ever-voluble Law does his best to stake his claim as Stott’s true friend and soul-mate. Stott meanwhile, is somewhat distanced from this action. And then we quickly cut back to the flat – and in such a way which suggests that the whole beach scene was just Law’s fantasy. Is it a good rule of thumb that any scene set outside the environs of the flat is fake? That could be so, but then some inside also have the same dreamlike quality. Time certainly seems to pass in a non-linear fashion (one minute there’s snow on the ground, the next moment it’s summer) whilst the décor of the flat also changes from scene to scene. The final few scenes, although flat based, are clearly fantasy (Law and Stott, each stripped to the waist, attack each other with broken bottles) although whilst the men are scrapping, Jane is shown to be working in the kitchen, which appears to anchor her – if not them – in reality. This switch between the unreal and real is fascinating. 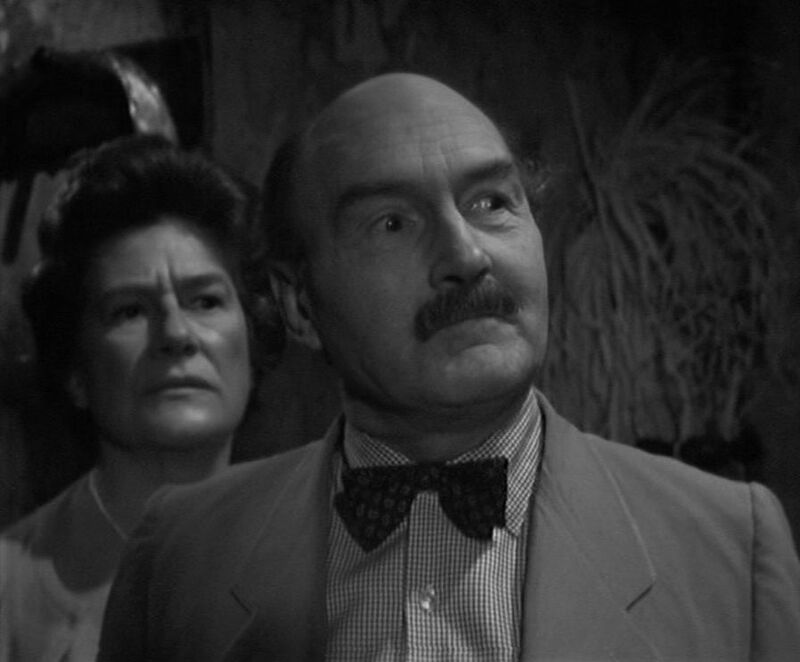 Although The Basement was staged several times (the London production of 1970 with Donald Pleasence as Law, Barry Foster as Stott and Stephanie Beacham as Jane sounds particularly intriguing) the strength of the piece is definitely its ability to rapidly change from one reality to another. Something that was simple to achieve on television (provided you had the time and the budget) but much more difficult to achieve on stage. I’d certainly be intrigued to see a staged production of the play, but I think it probably works best as a television entity. Critical reception was mixed, but most writers had positive things to say, even if some had to confess that they didn’t understand it all. Kenneth Eastaugh, writing in the Daily Mirror, decided that it was “a unique master course for everybody who ever aspired to write” although this was qualified by some criticism of Pinter’s performance whilst he felt that Markham was merely “adequate” in her role. J.D.S. Halworth in The Stage and Television Today also found some fault with Pinter’s Stott, although he/she was much more positive about Markham (both critics agreed that Derek Godfrey indulged in some skilful playing). Max Wilkinson in the Coventry Herald declared that although “I am not certain what the play was about or what it was saying … I will confidently assert it was masterly”. The Basement might be on familiar Pinter ground (unsettling and oblique) but it’s enlivened by some humorous moments. His final original work for television, it’s yet another which has aged rather well. Albert Stokes (Tony Selby), a shy young man, lives with his emotionally suffocating widowed mother (Anna Wing). His big night out – a works party – turns sour after he’s falsely accused of groping one of his female colleagues. After this bad start, his night just get worse and worse …. A Night Out was Harold Pinter’s first substantial success. It debuted on the BBC Third Programme in March 1960 before transferring to television a month later as part of ABC’s Armchair Theatre strand. This version, starring Tom Bell, Madge Ryan and Pinter himself, can be seen on volume three of Network’s Armchair Theatre releases. The opening scene establishes the strained relationship between Albert and Mrs Stokes. She reacts with surprise to the news that he’s planning on going out, despite the fact that he’s already told her several times. Her cheerful manner doesn’t waver – even when she’s bemoaning the fact that he’ll miss their regular Friday night game of Rummy – but it’s plain that in her non-confrontational way she’s keen to prevent his departure (not revealing the location of his precious tie, for example). Anna Wing offers a well judged performance, pitched just right. When Mrs Stokes enquires whether her son isn’t “leading an unclean life, are you? … You’re not messing about with girls tonight, are you?” it lays bare her central concern (with her husband dead, Albert is all she has left and clearly can’t bear the thought of losing him). Is it just a coincidence that these themes would be deeply mined just a few years later by Galton and Simpson in Steptoe & Son? Even down to the name Albert? Meanwhile, Tony Selby – as the softly-spoken, down-trodden Albert – is equally impressive. Although he’s treated with contempt by some of his colleagues – such as the arrogant Gidney (Patrick Cato) – Albert also has his supporters, notably Seeley (John Castle). Seeley and Kedge (Richard Moore) form an entertaining duo, enlivening the early part of the play with their inconsequential chatter. And once both reach the party they prove to be an instant hit with the ladies – indeed, they’re everything that the awkward Albert isn’t. Albert’s humiliation at the party sends him back home, but as he finds no succour there he heads out again, only to be picked up by a prostitute (Avril Elgar). Her lengthy, rambling monologue is deliberately wearying (it’s Albert’s misfortune to have stumbled into the company of somebody who, in their own way, is as controlling as his mother). Given this, it’s plain that their encounter won’t end well. Although Albert has found himself unable to express his true feelings to his mother (when he finally returns home again their uneasy status quo is maintained) he can at least vent his frustrations on the unfortunate chattering prostitute. If Selby has been cast in a submissive role for most of the play, then this climatic scene allows Albert’s tightly-wound persona free reign to explode. It’s nicely played by both Selby and Elgar. A Night Out, given the fact it was the most straightforward of the Pinter Theatre 625 trilogy, attracted the most critical acclaim. But whilst it has the most linear and comprehensible storyline of the three, like the other two it’s replete with disturbing and memorable dialogue. Edward (Maurice Denham) and Flora’s (Hazel Hughes) idyllic countryside life is disrupted by the arrival of an elderly matchseller (Gordon Richardson). Despite never speaking a word, the old man strikes fear into the heart of Edward and awakens in Flora long-buried sexual desires …. The first of three consecutive Theatre 625 plays by Pinter, which aired during February 1967, A Slight Ache was originally broadcast by BBC Radio in 1959 (Denham reprising his original radio role). The oppressive nature of silence, very much a Pinter trait, is a key theme of the play. Remaining mute and pretty much insensible throughout (although there are occasional indications that he can understand at least some of what Edward and Flora are telling him) the matchseller becomes a blank canvas – enabling Edward and Flora to project their own fears, hopes and insecurities onto him. Both direct several lengthy monologues towards him – for Edward they’re corrosive meetings, culminating in his total collapse. Denham excels throughout (and despite having to handle some very intricate dialogue rattled off at a high pace never falters). He’s matched by Hughes though, although Flora’s meetings are very different from Edward’s. Edward rambles around a stream of disconnected topics, finding difficulty in asking any straight questions, whereas Flora is much more forthright. For example, she begins by wondering if he could previously have been a poacher (she confides in him that she was raped by a poacher as a girl). This remembrance awakens a sexual thrill in her, which is designed to be a disconcerting revelation in someone previously presented as a loyal and dutiful wife. Prior to the arrival of the matchseller, the pair have several lengthy scenes – beginning at the breakfast table – which help to establish their relationship. A running battle with a wasp (eventually trapped by the forceful Edward in the marmalade jar) takes up a good few minutes and manages to be both amusing and oddly disturbing. At this point Edward is the dominant force, but once the matchseller appears, their roles become increasingly reversed. Apart from the actors, Barry Newbery’s sets are an obvious star of the production (the lush garden is particularly impressive). Christopher Morahan’s direction has some nice flourishes, but with an enclosed location and only three actors it has to be fairly static at times. Amanda Wrigley’s notes in the BFI booklet reports that contemporary critical reaction to A Slight Ache was poor. That may be, but there was the odd positive notice. Kenneth Eastaugh in the Daily Mirror commented that the play “like all Pinter’s works is for all times and for all mediums. Because it’s all about what goes on inside people – and we never change”. W.D.A. in the Liverpool Echo was less forgiving though, finding it doubtful that anybody would have given the old matchseller such free reign (“it seemed highly questionable”). Whilst it’s easy to sympathise with W.D.A.’s point of view, it doesn’t prevent A Slight Ache from being a tightly performed psychological drama. True it does sag a little in the middle, but it may be that future rewatches will prove to be rewarding. This is an incredibly welcome release, as it brings together a very healthy chunk of Harold Pinter’s BBC output (none of which has been commercially available before). Indeed, Pinter’s television work on DVD has, until now, been rather sparse (a few isolated offerings from Network – the Armchair Theatre production of A Night Out and the Laurence Olivier Presents staging of The Collection – have been the highlights so far). Tea Party was commissioned for a prestigious Eurovision project, entitled The Largest Theatre In The World, which saw the play performed in thirteen separate counties over the course of a single week (some took a subtitled version of the BBC original whilst others staged their own adaptation). It’s a layered and uncompromising piece, with Leo McKern mesmerising as a self-made businessman who begins to lose his sense of reason (and also his sight). Has he been destabilised by inviting his brother-in-law Willy (Charles Gray) into his business or has his infatuation with his new secretary, Wendy (Vivien Merchant), pushed him over the edge? Do his two young sons from his first marriage really harbour evil intentions towards him or does his new wife, Diana (Jennifer Wright), possesses secrets of her own? So there are plenty of questions, but as so often with Pinter the answers are less forthcoming. The final scene is extraordinary. 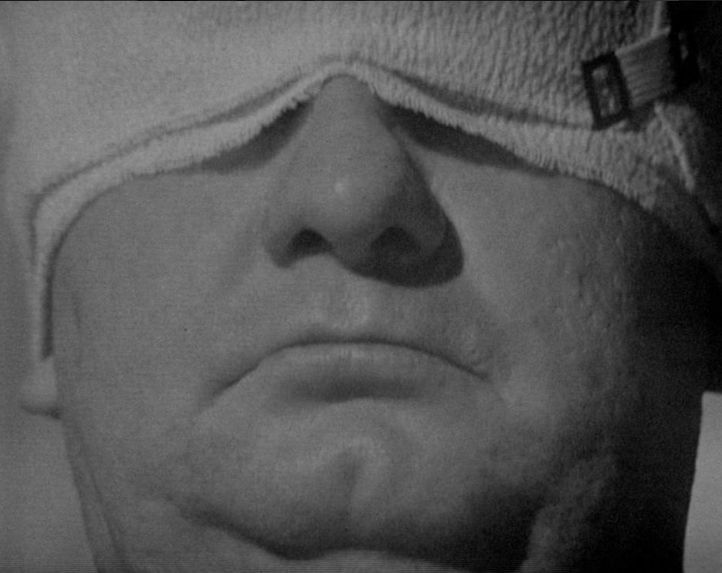 Disson (McKern) – his eyes firmly bandaged – sits immobile in the middle of a party held in his honour. Although Disson plainly can’t see, we’re privy to his thoughts (he imagines a three way intimate exchange between his wife, brother-in-law and secretary) as he slowly regresses into a catatonic state. All of the principals offer polished performances, with Merchant – Pinter’s first wife – especially eye-catching. Given the subject matter and the already rocky relationship she was enjoying with Pinter, it’s fascinating to ponder just what she made of the material. Tea Party is fluidly directed by Charles Jarrott and given that the cameras of this era were bulky and not terribly manoeuvrable, some of his shot choices are quite notable. It’s a shame that the telerecording isn’t of the highest quality (a new 2K transfer was struck for this release, but given the issues with the original recording the benefit of this was probably minimal). A pity, but at least the worst of the print damage occurs early on. Harold Pinter contributed three plays to the Theatre 625 strand in 1967. For some reason the third of these plays appears on the first disc whilst the first two are featured on the second. That’s slightly odd, but since all three aren’t linked in any way it doesn’t matter which order they’re watched in. 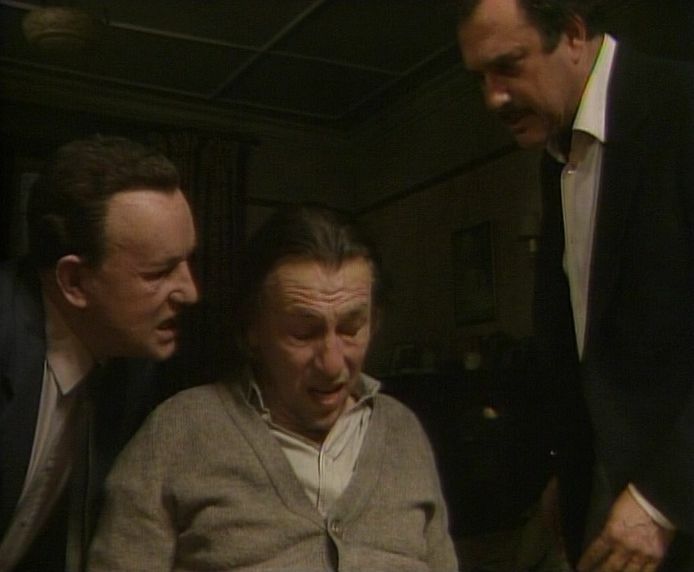 We’re in absolutely classic Pinter territory here as Law (Derek Godfrey) discovers his cosy basement flat has been invaded by an old friend, Stott (Pinter) and Stott’s young and mainly silent girlfriend Jane (Kika Markham). Initially pleased to see Stott, Law is less enthused – at first – about Jane …. The arrival of an outsider into a settled domestic setting is a dramatic device that Pinter would use time and again, but The Basement – the only one of his three Theatre 625 plays to be an original work – is notable since it plays with the artifice and techniques of television. Even more so than Tea Party, the line between reality and fantasy becomes increasingly blurred as the play continues. Some scenes (such as when Law and Stott, both stripped to the waist, fight each other with broken bottles) seem obviously fantastical, but what of the others? Time certainly seems to move in a disjointed fashion (one moment it’s winter, the next summer) whilst the final scene posits the possibility that everything we’ve seen has been a fantasy. Pinter is menacing and monosyllabic as Stott but not as monosyllabic as Markham’s Jane, who is passive throughout whilst Godfrey has most of the dialogue and seems to be the most decipherable character of the three. A tight three-hander, The Basement has aged well. 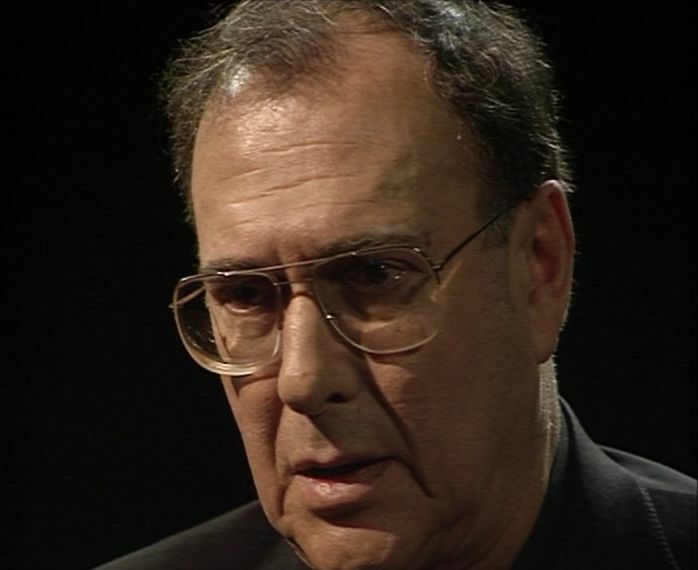 Writers in Conversation – Harold Pinter. A 1984 interview with Pinter, running for 47 minutes. Another three-handed play which also pivots on the arrival of an disruptive outsider, A Slight Ache boasts remarkable turns from both Maurice Denham and Hazel Hughes. Husband and wife – Edward and Flora – they seem reasonably content in their country cottage, but when they invite a nameless and mute matchseller (Gordon Richardson) into their home everything changes. Denham’s fussy, pernickety Edward is slowly destroyed by the matchseller’s ominous silence whilst Flora finds that her long-dormant sexuality has been reignited by his presence. Some contemporary reviewers found this a little hard to swallow, but realism isn’t the chief component of this play. The matchseller simply serves as a catalyst for Edward and Flora to indulge in several powerful monologues. Despite its radio origins, A Slight Ache has a much more of a theatrical feel than The Basement. Barry Newbery’s sets (especially the lush garden) are a highlight of the production. It’s interesting to be able to compare and contrast this production of A Night Out to the 1960 Armchair Theatre presentation. Honours are pretty much even, with Tony Selby here proving to be equally effective as the repressed mummy’s boy as Tom Bell was back in 1960. Anna Wing, as the mother in question, makes for an imposing harridan – although wisely she doesn’t overplay her domineering nature. Albert (Selby) is all she has left, but she ensures that her psychological games comprise honeyed words and pitiful entreaties rather than abuse. Albert’s humiliation at an office party eventually leads him to a prostitute (Avril Elgar). That she, in her own way, is just as controlling as his own mother unleashes his ugly side. All the pent-up emotions he can’t express at home are unloaded on this poor unfortunate. Well-cast throughout (John Castle and Peter Pratt catch the eye) A Night Out is the most straightforward of the three Pinter Theatre 625 productions, but is no less fascinating. We’re now in colour for the fifth play in the Pinter set. At just twenty minutes it’s one of the shortest and only features a single actor – Henry Woolf, but it still packs plenty of content into its brief running time though. An unnamed man (Woolf) addresses an empty chair, which is standing in for his absent friend. Or does he believe that his friend is actually sitting there? Or is his friend simply a figment of his imagination? As so often, several readings can be made, each one equally valid. The story which unfolds – male friendship disrupted by the arrival of a female – echoes back to the likes of The Basement and is skilfully delivered by Woolf. One of Pinter’s oldest friends (the pair enjoyed a relationship for more than fifty years) Woolf doesn’t really put a foot wrong (he later reprised this piece at the National in 2002). This might be a Pinter in miniature, but is certainly deserving of attention. Something of a neglected piece (there’s no listing on IMDB for example) hopefully this DVD release will shine a little more light on it. Old Times has a very theatrical feel. This form of television staging would eventually fall out of fashion – for some it was simply electronic theatre (a bad thing apparently). But it’s always been a style that I’ve enjoyed – when there’s no location filming or clever camera angles, the piece has to stand or fall on the quality of the writing and acting. It’s another triangle story – married couple Deeley (Barry Foster) and Kate (Anna Cropper) find their status quo disturbed by the arrival of Kate’s old schoolfriend Anna (Mary Miller). With Kate remaining passive for most of the play she becomes an object that both Deeley and Anna seek to claim as their own. Several theories have been propounded to explain the meaning of the play. When Anthony Hopkins tackled the role of Deeley in 1984 he asked Pinter for some pointers. The playwright’s advice? “I don’t know, just do it”. Anna’s presence at the start of the play (standing at the back of the living room in darkness and immobile) is a early indictor that the production isn’t striving for realism. She shouldn’t be there – the dialogue between Deeley and Kate makes it clear she’s yet to arrive – so her presence ensures that a tone of oddness and disconnection is set. Foster and Cropper duel very effectively (a lengthy scene where Deeley and Anna discuss the best ways to dry a dripping wet Kate is just one highlight). Puzzling in places (has everything we’ve witnessed simply been Deeley’s imaginings?) Old Times is nevertheless so densely scripted as to make it a rewarding one to rewatch. Landscape is a two-hander shared between husband and wife Duff (Colin Blakely) and Beth (Dorothy Tutin). Both indulge in separate monologues which never connect to the other person’s conversation. Beth in fact never acknowledges Duff’s presence, although he does appear to know that she’s there (or at least that someone is). The Lord Chamberlain’s office, back in 1967, found itself unimpressed with Landscape. “The nearer to Beckett, the more portentous Pinter gets. This is a long one-act play without any plot or development … a lot of useless information about the treatment of beer … And of course, there have to be the ornamental indecencies”. A little harsh maybe. Landscape is plotless but leaves a lingering impression. The music, composed by Carl Davis and played by John Williams, helps with this. Pinter’s People – four animated short films (each around five minutes) from 1969. A pity that a fifth – Last To Go – couldn’t be included for rights reasons, but the ones we do have are interesting little curios (Richard Briers, Kathleen Harrison, Vivien Merchant and Dandy Nichols provide the voices, so there’s no shortage of talent there). The Hothouse (27th March 1982). 112 minutes. Watching these plays in sequence, what’s especially striking about The Hothouse is just how funny it is. There have been moments of levity in some of the previous plays, but the farcical tone seen here is something quite different. Originally written in the late fifties and then shelved for twenty years, The Hothouse is set in a government rest home which, it’s strongly implied, uses any methods necessary to “cure” its unfortunate patients (who we can take to be political dissidents). Although a dark undertone is always present (indeed, the play concludes with the offscreen deaths of all but one of the senior staff) there’s also a playful use of dialogue and even the odd slapstick moment. Derek Newark as Roote, the hopelessly out of his depth manager, steamrollers his way through scene after scene quite wonderfully. A man constantly losing a running battle to keep his anger in check, Roote seems incapable of understanding even the simplest of thing. Although he might not be quite as dense as he appears (and his culpability in the death of one patient and the pregnancy of another is also open to interpretation). With a strong supporting cast, The Hothouse was certainly the most surprising of the main features. Mountain Language (11th December 1988). 21 minutes. A one-act play which was first performed at the National Theatre in late 1988, it swiftly transferred to television just a few months later with Michael Gambon and Miranda Richardson reprising their stage roles. One of Pinter’s more political pieces, Gambon and Richardson (along with Julian Wadham and Eileen Atkins) all offer nuanced performances. Gambdon and Wadham are soldiers, facing down a group of prisoners who include Richardson and Atkins. Language, so often key in Pinter’s works, is once again pushed to the forefront. Mountain Language is another prime example of the way Pinter could make an impact in a very short space of time. The Birthday Party (21st June 1987). 107 minutes. Written in 1957, when Pinter was touring in a production of Doctor In The House, The Birthday Party was Pinter’s first full length play. Revived thirty years later for this Theatre Night production, it’s plain that time hadn’t diminished its impact. Kenneth Cranham is mesmerising as Stanley, a man haunted by vague ghosts from his past. Treated with stifling maternal love by his landlady Meg (Joan Plowright), the arrival of two mysterious strangers – Goldberg (Pinter) and McCann (Colin Blakely) – marks the beginning of a nightmarish twenty four hours. Also featuring Julie Walters and Robert Lang, The Birthday Party baffled many critics back in the late fifties – the reason why Goldberg and McCann have decided to target Stanley and the others is just one puzzle – but in retrospect it’s fascinating to see how key Pinter themes, such as the reliability of memory, were already firmly in place. Face To Face: Harold Pinter. 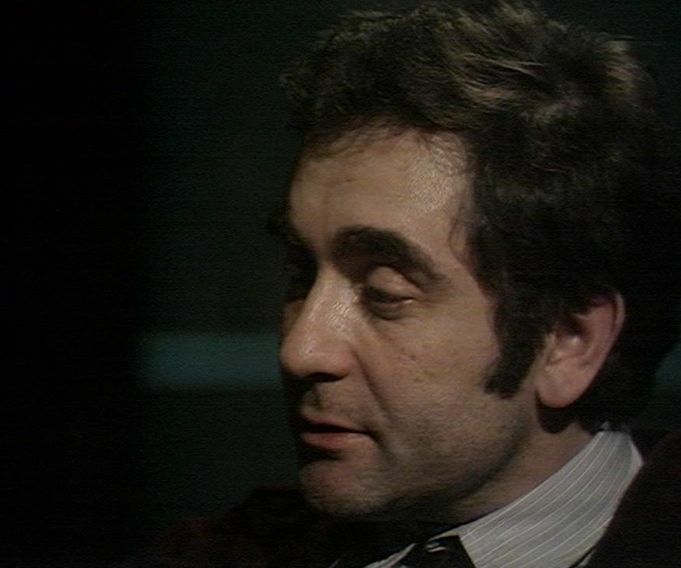 Sir Jeremy Isaacs is the out of vision interviewer since – as per the style of all the programmes in this series – the camera remains firmly fixed on Pinter throughout. Some decent ground is covered across the forty minutes of this 1997 interview. Harold Pinter: Guardian Interview. Audio only, 73 minutes. This is selectable as an additional audio track on The Birthday Party, even though it doesn’t directly refer to that play (or run for its whole length). It might only be January, but this looks set to be one of the archive television releases of the year. Highly recommended. 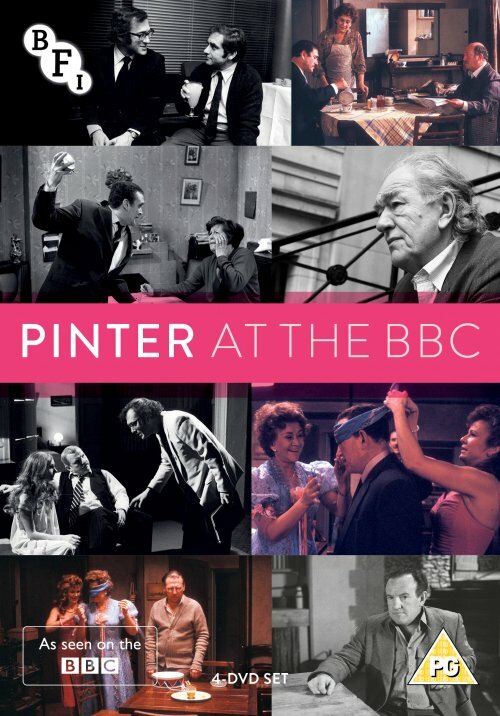 Pinter at the BBC is released by the BFI on the 28th of January 2019.